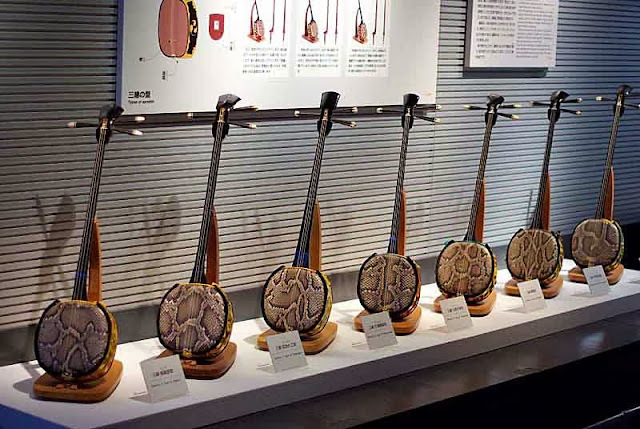 Ryukyu Life: Surprise: We Got to Shoot Seven Sanshin All in a Row ! Surprise: We Got to Shoot Seven Sanshin All in a Row ! It wasn't the instruments lined up on the shelf that surprised me. The location and, the fact they let me take photos, made my day. This was in the Okinawa Prefectural Museum. There's just enough redneck left in me to avoid places I can't take my cameras. Several (formerly) reliable sources had told me "No Cameras Allowed" in there. So, for years, I avoided going in. Why would I want someone to take my money, if I can't shoot ? Wednesday, we decided to give the museum a try. It was one of those days where no outdoor photography would happen. On a cold, wet morning, Doc Graff and I, both promised the women, we would stay indoors. As we approached the museum, in Naha, we carried our cameras. At least photos could be taken, right out in front of the joint. We took a few shots, then holstered the cameras. Inside, I walked up to the ticket office and, asked if cameras were allowed. Ya Hu Hu Hu Cameras Go Right Through ! There are a few restrictions, though. Some areas, are off limits, for photography. And, you can't use flash, anywhere. That was enough to make me run back to the car and, grab all three cameras. Then, I went and bought a 400 yen ticket. We hit one little snag, after that. The lady selling admission didn't mind the tripods. The gal taking tickets at the entrance, minded. No tripods are allowed to be used inside the museum. She let us check them in at the counter and gave us receipts. Using a prime 50mm lens at ISO 100 f/1.8 1/15sec we gotterdun. How do you keep the camera steady when no flash or tripod is permitted ? Eat a balanced diet, get enough sleep and, don't drink cheap booze !